Their data indicates the fissure now extends for some 175km. But just how long it will take before the 5,000 sq km block finally breaks free is anyone’s guess, says Swansea's Prof Adrian Luckman. "The rift tip has just entered a new area of softer ice, which will slow its progress," he told BBC News. "Sometimes rift growth is triggered by ocean swell originating elsewhere, which is also hard to predict." In the case of Larsen B, those glaciers subsequently sped up in the absence of the shelf. 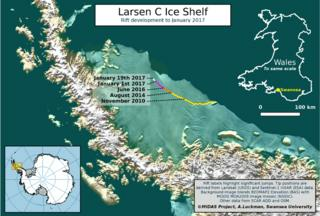 And it is the land ice - not the floating ice in a shelf - that adds to sea level rise. "Sea ice in the region circulates clockwise with the Weddell Gyre, rather than remaining in one place, and icebergs can be carried with this, sometimes out into the Southern Ocean," explained Prof Luckman. "It all rather depends on how soon the iceberg breaks up, and how the iceberg draft compares with ocean depths. "Ocean depths are not perfectly known in the region precisely because the near continuous ice cover makes ship operations difficult."